For sure the Queen’s Gardens (Los Jardines de la Reina) are one of the best places in the world for diving and for unforgettable dives with the sharks!!! Aside from stunning variety of marine life, the above surface flora and fauna is fascinating. Bird varieties commonly seen includes ospreys, pelicans, frigate birds, spoonbills, and many different sorts of heron and egret – to name a few. The only mammal is the “Jutia” while reptiles are represented by a large population of iguanas. The flora is mainly palm trees, differing forms of Caribbean pine trees, sea grapes and the ever present mangroves. However, like so much of the Caribbean, the real beauty is below the surface. Besides the extensive flats there is a chain of coral reefs very close to the southern shore of the Archipelago, where undisturbed and undamaged coral abounds. 60 miles south of the mainland of Cuba and 80 miles north of Cayman Brac is a 75 mile long mangrove and coral island system forming what some people say is the third longest barrier reef in the world. It’s a 2.400 square miles Marine Park. There is NO COMMERCIAL FISHING in the Park and the number of inhabitants is ZERO. The mangroves provide an incredible nursery for the smaller fish which in turn provide the reef with huge schools of baitfish. This has provided a home to a prolific number of LARGE fish (we think more than anywhere else in the Caribbean) . Shark rodeos and hand feeding 200-400 LB Jewfish are an everyday experience. Sharks are one of the main attractions and are every-where. You can easily dive weekly with 5 different species of Carcarinus: Silky, Caribbean Reef, Lemon, Black Tip, Nurse, and you ha chances to dive also with Whale Sharks and Hammerhead Sharks. Avalon Diving Center is the only operation allowed by law in this entire area, and hosts no more than 300 divers a year. Certainly, it is one of the last virgin reefs known to man. 80 dive sites are currently available, scattered over the entire perimeter of Los Jardines de la reina. 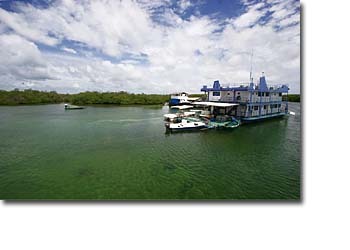 Dive sites are well protected from the winds and sea currents. Our dive centre is well equipped with new compressors, tanks and weights, and two big dive boats. 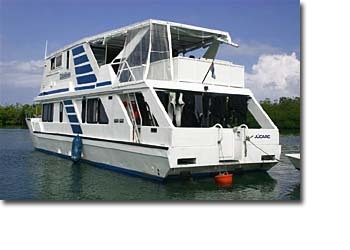 Provides 7 cabins, each with their own shower, toilet and air-conditioning facilities. Staffed by Cubans but run by two Italians managers, the floating resort has also good communication with the outside world, including a satellite telephone and internet. 6 cabins, 3 bathrooms cold-hot water, air conditioning. The crew is made up of 3 person and a professional cook. 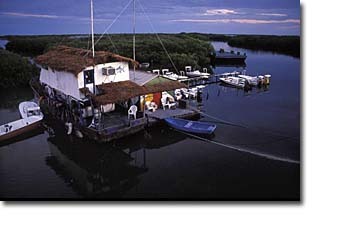 Halcon gives the possibility to reach the diving sites in a few minutes by boat, and allows to live at close contact with a still wild nature, without having to give up all the comforts that a hotel can guarantee. It is 75 feet long. 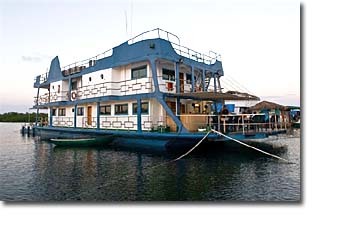 The Caballones is a new very comfortable yacht, fully refurbished at the end of 2006 75 feet in length, all rooms have air conditioning, 4 double rooms (one has a queen bed for a couple) and 4 bathrooms, a large upper deck where meals are usually served from a "on show " cuisine! Showers with hot water makes life comfortable thanks to a new water system. The professional cook on Caballones does a wonderful job with meals. 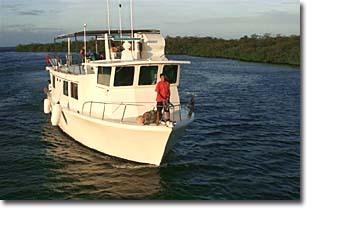 You can also admire this wonderful Marine Park cruising aboard of the Explorador, 65 feet long, 4 cabins, 4 bathrooms, cold/hot water, A/C. 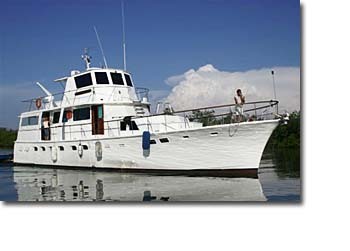 Both solutions give the freedom of exploring the Archipelago and are great for groups for an exclusive experience. Food concentrates on local fish and shellfish, together with fruit, pasta and rice. Beverages available on board include mineral water, various soft drinks, beer, wine and, of course, rum.